Orion, hic etiam eius regio spatialis visus. Constellatio Orion ad stellas siderum vicinorum inveniendas adhiberi potest. Herculis sidera sicut possunt nudis oculis videri. 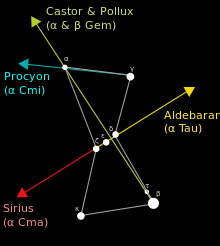 Constellatio (Latinitate classica sidera et signa n. pl., atque apud poëtas sidus) est figura stellarum in caelo. Octoginta octo constellationes hodierno tempore in caelo ab Unione Astronomica Internationali dignoscuntur. Multae constellationes varios modos delineari possunt, et itaque haud habent solam formam. Aliis rebus in usu constellationum, est potes constellationes et stellas adhibere invento constellationum et stellarum in spatio, atque gubernationi vehiculorum. ↑ Ammianus Marcellinus, Res gestae 29.2.27; Historia Augusta "Gordiani" 20, etc. "The Constellations" in Richard Hinckley Allen, Star-Names and Their Meanings (Stechert, 1899) Textus apud archive.org Textus apud LacusCurtius. Vicimedia Communia plura habent quae ad constellationes spectant. Ian Ridpath, Star Tales Textus. Novissima mutatio die 23 Ianuarii 2019 hora 20:38 facta.